Obituary for Darlene Shaffer Frederick | Carlson-Shugarts Funeral Home, Inc.
Darlene Shaffer Frederick age 68 of Pleasant Avenue Punxsutawney, PA; died on Tuesday June 5, 2018 at the Punxsutawney Hospital. Born on December 21, 1949 in Ridgway, PA; she was the daughter of the late Lloyd and Margaret Courson Shaffer. Darlene was married to John W. Frederick and he preceded her in death. She was then married to Paul Anderson and he preceded her in death. She then married Paul Fishel and he survives. Darlene worked as a private duty caregiver. 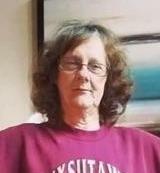 She loved to read, listen to country music, learn how to use her computer and she especially enjoyed spending time with her dogs and her family. She is also survived by a son Rodger (Michelle) Frederick of DuBois, PA; 4 daughters: Rhonda (Eric) Thompson of San Antonio, Texas; Traci Sherwood of Punxsutawney; Tammy (Timothy) Waite of Cherry Tree, PA; Alicia (Sorita) King of Houston, Texas; 3 sisters: Deloris (Larry) Lundberg of Daytona Beach Shores, Florida; Nadine (Randy) Hutchins and Annette (Michael) Clark both of Brockport, PA. Darlene is also survived by 2 grandsons, 7 granddaughters and 2 great granddaughters. She is also preceded in death by a daughter Margaret Anderson and a sister Wanda Smith. Calling hours will be on Friday June 8th from 9:00 AM to 11:00 AM at the Carlson-Shugarts Funeral Home Inc. in Brockway. A Funeral Service will be held at 11:00 AM also at the funeral home with Rev. Terry Felt officiating. Burial will follow in Parklawn Memorial Gardens in Ridgway.